This past weekend I helped fire the wood kiln at Laurelville. The kiln is operated by the Union Project, and I consider myself fortunate to be involved with such good people (although I am not actually a member of the UP myself). For those unfamiliar with the wood firing process, you have to feed the kiln wood for quite some time, often 24 to 36 hours or more. This requires a lot of labor. Even loading such a kiln takes several hours, and the unloading process involves some fairly heavy duty cleaning chores. After helping to load the kiln, I took the first shift "stoking" or feeding the fire from 6:30 PM on Friday to 1:30 AM on Saturday. Essentially, I was pre-heating the kiln, slowly bringing it up to 400°F. 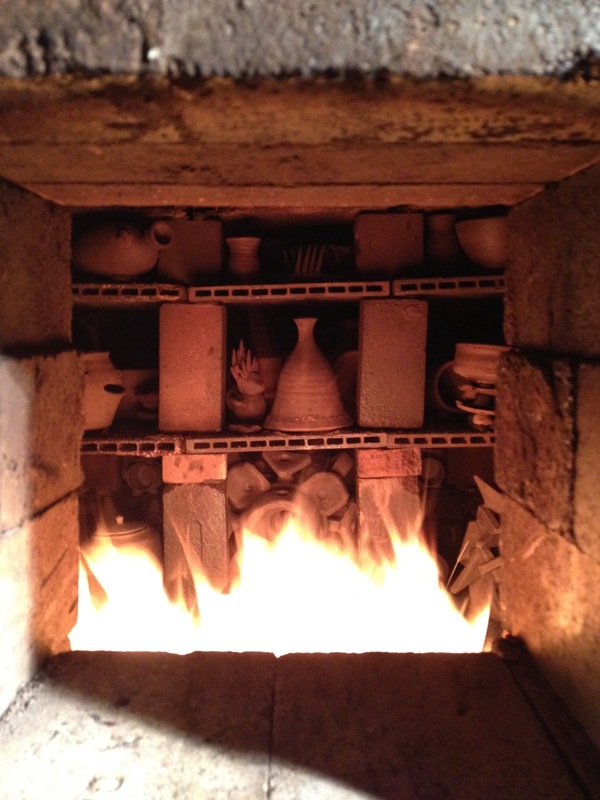 What's cool about this part of the firing is that you can still look into the kiln and watch the pots start to collect ash. Because this kiln's design doesn't use a bag wall (rows of bricks between the open flame and the pottery) the pots in the front row are going to receive a heavy dose of fly ash. Needless to say, I'm excited to head out to the kiln site on Wednesday to unload it.